Residential elevators are basically scaled down versions of the elevators seen in apartment buildings and office towers but usually use a different drive system. They are fully enclosed compartments which travel up and down a shaft. Wheelchair vertical platform lifts on the other hand tend to be more like a porch or deck lift enclosed in an elevator shaft and considerably less expensive. The traveling platform is completely open above and the shaft must be constructed so there are no pinch points. Elevators and wheelchair lifts are big, heavy pieces of equipment and installation requires some logistical and construction knowledge, not to mention experience. 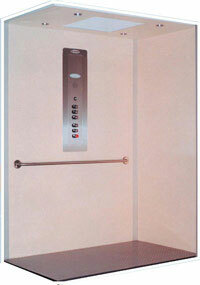 Installation of each type of lift is how they work is quite similar. A shaft for the elevator or lift is required. Installing a shaft in an existing house can be a major expense as often plumbing, heating ducts or wiring must be rerouted not to mention floors have to be cut out and new walls built. On the other hand, the cost can be negligible when building a new house or adding on an addition as the shaft will be planned for in advance. Some of my clients have planned in advance for the expected need of an elevator and had the shaft built during construction of the house or addition. They have had the shaft built with removable floors and used as large closets until the need arose for a lift to be installed. Doors at each level that will not open unless the lift is at the same level. The lift will not move if any door is open. Telephone available in some models (optional). Emergency stop switch in the cab. Keyed call buttons and cabin controls (optional). Battery powered back up lighting (some models). Battery operation during power failures (some models). Slack cable safety to lock cab in place should the lifting cables become slack. Powered door openers are standard on some models and optional on others while after market openers can be added to some lifts. These are helpful for people who might have difficulty opening the doors to the lift but require electric doors strikes for the after market door openers. There are least two models of "through the floor" lifts that I know of which are an alternative to the more conventional elevators and vertical lifts. The trade names are "Minivator" and "Telecab" and are made by different manufacturers. These lifts are enclosed cabs which travel up and down a track mounted to a wall through a floor. When the lift moves up, the top of it pushes up a section of the upper level floor as it passes through. When it returns to the lower level the floor drops back into place to fill the hole in the floor. The big advantage of this system is the lift does not require a shaft and takes up much less floor space at the level it's parked and takes up no floor space at the other level.